A piece-of-cake Valentine project: bend regular paper clips into little heart shapes. These are jumbo clips I got in a multi-color pack at Target for about $1.50, I think. I fished out the pink ones for this. You could use them to leave love notes around. Or mark pages you like in magazines. Or hold tiny treat bags of candy shut. Or send a subtle message to the boss you have a crush on. Endless possibilities, really. How darn cute is that! Of course I had to try it immediately. Too bad I don't have any pink or red paper clips. Still looked cute, though! Cute and easy! I'll be spreading those around the office. I work at a school, and everybody is getting little silver paperclips this week! This is so cute and such a great idea. I know I have some fun colored paper clips lying around that this would be perfect for. You're awesome! That's such a great idea! Thanks so much! I had to grab a paperclip on my desk and try it. It works, it works. Now the girl in payroll with think I have a thing for her when I send my paperwork over with a heart clip! Very cute. I saw that first here http://www.ismoyo.com/2008/02/to-make-heart-shaped-paperclips.html last year, yet I can't find the cute little pink and red clips they used. Small green metal paperclip just sitting on my desk looking bored, now bent into heart shape. SO cute. Thanks! Foobella, aw, those are so cute and teeny! I wonder where that person got them. I haven't seen any little red ones around. Although I haven't done much paperclip shopping recently, I have to admit. This is great! I am posting a link to it on my blog right now! Adorable...don't you just love target! I think they have a variety of colors and sizes at staples...but, I have to admait I haven't been there lately. That has got to be one of the cleverest cutest things I have ever seen. The only thing that would make them better is if they were ORANGE! I love it! And I love that I have a drawer full of those paper clips now, so I don't have to go get anything! Off to make some heart clips. Thanks!! I love them! So dang creative, you are! Well isn't this a surprise- I was bored and playing with the 'stumble-upon' button and I stumbled on one of my most favourite blogs! This so awesome!! Really cute idea. this is one awesome idea!! love it to pieces! Yay, I just went and snagged some pink from our office supply closet. that is so creative! i'm copying for certain!! I've hearted all my colored clips at my desk and now I need more!! Thanks!!! you are a total genius! but we knew that already:) it's these simple things... a little twist here or there and magic. thanks Jessica! This is such a cute little embellishment...TFS! Oh I love this! I am going to try to do one right now. This such a cute FUN easy thing to do! This ist so cute, perfect for Valentine and other occasions. Thank you very much! Novel idea... I can't wait to start bending all the colorful paper clips I just purchased! Just in time too! Those are so cute! Just made a few. Along with the previous comments, I too could not track down pink or red clips. So, to make the plain silver ones seem extra festive I painted them with nail polish and let them dry. So cute - I totally love it! Wow, so simple. Great idea! way cute! I posted it on my blog as well. Gotta' love something that's so simple, yet so cool! Gotta love something so simple, yet so cool! Now I'm in a mad search for some paper clips! I posted this link to your blog on my blog and everyone loved it! Such a great idea!! Oh that is so cool. I tried it and it worked right away. Paper clips will never be the same for me now. LOL! <3 Thank you. So very sweet! I had to share. Thank you! Love your blog...will link it to mine I just started...! haha! I love it! And yes - I also had to make one straight away! I have some super cute small red and white striped ones so they look cute as! Try positioning it on the table EXACTLY like the "before" photo in the bottom picture. See that long end of wire on top, pointing to the left? Your goal is to get that part pointing downward, behind the rest of the paperclip. Now pick it up and hold it in that same position. Put your left index finger at the midpoint of the bottom edge of the paperclip and use your right hand to bend the right half of the paperclip upwards, making an "elbow" right there. Hope that helps! I read three books at a time (I think I maybe ADHD) so if I run out of bookmarks I ALWAYS have paper clips. I also loved your site, I am attracted to pretty colors. These are simply adorable! I will have to use some of these at the office this week. You gotta be kiding me!! what are you people using to bend the clips?? its NOT easy. It's an splendor!!! So useful!! cute... but was this photoshopped for some reason? Whay is the little end of the clip like twice as big after the bend? I assume the right side of the photo is supposed to be the sa,e size clip after the bend. good article. I like it. Great, I love this kinda why-I-never-thought-of-that tricks. And this one is the best I've seen around this time. So simple and so cute!!! But why i have plenty of paper clips but all have only one round side ?! I really need to go shopping! I remember this from years ago when somebody at school taught me how to do this. Thanks for reminding me...they are perfect made with pink clips, so cute! Okay..maybe im not so bright..but it took my a full work day and about 50 slips to finally "get" how to make the bend. However, today i'm making hearts like crazy! I love this idea! coppy cat I did the same thing!!!! hay how weird I did the same thing. Funny. to me. Your blog is very nice . 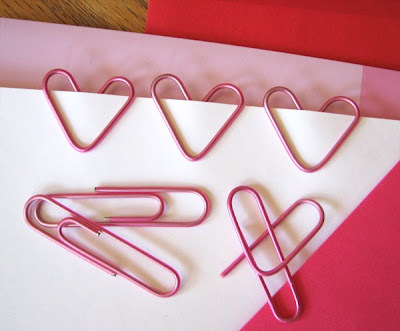 I like these heart-shaped paper clips, and is so easy. Thanks Jessica for sharing this kind of funny tricks. Playing with colors is really a great thing and that too students in the play schools will love playing with colors. OMG! this is SOO cute! When I go back to school this fall, I am gonna make tons and give them to all of my friends. :) This is too cute! Too bad I don't have any colorfull paperclips! I only have the silver ones. Looks like I will just have to go out and buy some. NINETY FOUR comments about paperclips? They are cute though. Thanks for this nice info info, it's so useful for me. I will try this immediately. cool! I dont get it how do u bend it at midpoint? Too cute!! If you bend the paperclip in the opposite direction, you get the same effect and an even bigger heart. Great for teachers. Thanks! This 's so Awesome !! !Thanks anyway ! Neat idea. AND it actually improves the clip's performance. Bonus! Thanks for this Idea! I was looking for a cute paper clip to buy because I wanted to crochet a bookmark and a crocheted chain then attatch the chain to a cute clip that would clip to the back cover of the book so that your book mark wouldn't fall out and would hang from the clip at the back while you read and just be put between the pages when you stop reading.. It is very cute and so easy, thank you very much for sharing the simple but marvelous ideaJ Now I’ve tried to make the paper clip heart-shaped, but it’s broken. I should take more thick one. I’ll use the info for my paper writing. I used to make these all the time at school (obviously in break times and not during lessons!). I shall now be using them on all of my correspondence. This could be really useful to impress my girlfriend thanks for sharing such a cool post. nice post, thanks for the great sharing. Pretty nice place you've got here. Thanx for it. I like such themes and anything that is connected to them. I definitely want to read more on that blog soon. OMG I CANT DO IT!!! 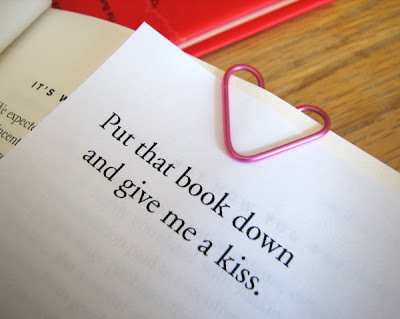 What a brillant idea...I love it!!!! Very, very cute.... looks easy. My girls would love to try this. It was a very good ice-breaking activity on our Valentine-party for 4 teen girls. They love the heart shaped clips!!Thanks!!! Adorable...don't you just love target! I think they have a variety of colors and sizes at staples.. Thank you for such a simple solution!!! I need tese to finish off my wedding invites!!!! I mest up 4 paper clips and gave up someone would like to help me? It would be even cuter if they looked like hearts and held paper! you're a freaking genius, Jessica! Please see if that is ok for you. Of course I put a link to your site. I can find no way to bend it - either I am not strong enough or my paperclips are too durable. Any ideas? I think it must be your paperclips— I am wimpy and did it with my fingers. Try with another kind? Ok, thanks Jessica. I'll see if I can find another type. I AM SOOO STUPID! I can not figure it out! I have tried several times and they don't come out. Do you need to use the Large paper clips?? Mine are medium but I still can't figure it out?? Any size will work. Hold the clip so it's positioned like in the "before" picture. Bend the big curved end upward, so it makes an "elbow" in the middle of the clip. The long straight leg of that part should naturally go downward behind the small curved end.